Back when I started building my own PCs, tempered glass wasn’t a thing yet. I was fortunate enough to miss the days of plain beige boxes. However, most of the machines I pieced together were still housed in unassuming black enclosures. Sometimes I used cases with acrylic side panels, giving me a look at the goods inside, but this predated the RGB lighting craze, so there was really only so much to show off. My, oh my, how things have changed. These days, if you aren’t loading illuminated graphics cards, memory modules, and light strips into a case with windows on every side, what are you even doing? True, high-performance PCs don’t need all of those aesthetic extras to flex their considerable muscle, but then sports cars don’t need gullwing doors, either. It just feels wrong to dress extreme horsepower in anything less than extreme bling. That’s why we’re wrapping our latest ultra-fast Ryzen-based system in a showpiece case with RGB-lit components and more light strips than an airport runway. Every build should start with a stable platform loaded with useful features, so we chose the ROG Crosshair VII Hero WiFi as our system’s foundation. At $299.99 USD, it’s not particularly expensive for an enthusiast-class motherboard. But it’s well-equipped to handle tons of lighting. Its chipset heat sink features an RGB-backlit Republic of Gamers logo, while the I/O cover has an illuminated CROSSHAIR VII and accent dash underneath, as well. 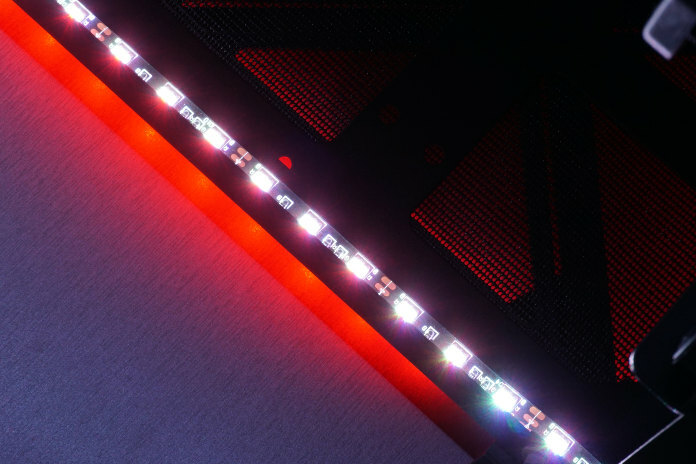 There are four headers for connecting light strips, so the Crosshair VII Hero WiFi enables hundreds of RGB LEDs at a time, and support for Aura Sync takes care of synchronizing colors and effects between compatible components plugged in to the motherboard. This leaves those Aura RGB and addressable RGB headers available for extra lighting. Equipped with an AMD X470 chipset and ready to accommodate any Socket AM4 processor, the stealthy-looking Crosshair VII Hero WiFi is laden with the integrated features befitting an enthusiast-oriented PC. We only used one graphics card for this build, but there’s room in our case and on the motherboard to support up to three-way AMD CrossFire X configurations and two-way SLI setups. Two SafeSlot-reinforced PCI Express slots ensure that even the heaviest high-end graphics cards are held in place securely. Four DIMM slots support up to 64GB of DDR4 memory whether you drop a first-gen Ryzen, second-gen Ryzen, A-series, or Athlon X4 CPU into the Socket AM4 interface. The Q-DIMM design makes it easier to upgrade your memory configuration down the road by popping one clip and pulling each module out. Storage options are plentiful. The board has six SATA 6Gb/s ports, along with a couple of M.2 slots with x4 PCIe connections for ultra-fast SSDs. The integrated audio features our SupremeFX S1220 10-channel codec with support for 32-bit/192kHz playback. An ESS Sabre ES9023P digital-to-analog converter, a TI RC4580 op amp, and Japanese-made Nichicon capacitors ensure the sound that you hear, whether it comes from a 7.1-channel surround system or your gaming headset, is crystal-clear. The I/O panel is a wonderland of connectivity. 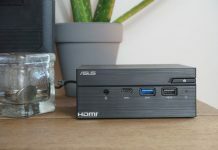 It hosts eight USB 3.1 Gen1 ports, a USB 3.1 Gen2 Type-A port, a USB 3.1 Gen2 Type-C port, and two USB 2.0 ports, along with a PS/2 port for legacy input devices. There’s also a LAN port powered by Intel’s i211-AT GbE controller, optical S/PDIF out, and five audio jacks. A pair of coaxial connectors correspond to a bundled 2×2 dual-band Wi-Fi antenna, which gives the ROG Crosshair VII Hero Wi-Fi wireless transfer rates as high 867 Mb/s using 802.11ac. The Socket AM4 interface was designed to support a broad range of AMD CPUs, but because we’re putting our emphasis on high-end speed and good looks to match, we dropped in the company’s Ryzen 7 2700X processor, which will set you back about $275 USD. This powerful chip is composed of eight cores with simultaneous multi-threading, allowing it to operate on 16 threads at a time. A base clock rate of 3.7GHz accelerates up to 4.3GHz in lightly threaded applications, yielding the best possible blend of frequency and utilization, depending on your workload. Good luck finding a faster AMD Ryzen processor for mainstream desktops. We put AMD and AMD together in this build, pairing the mighty Ryzen 7 2700X with an ROG Strix Radeon RX Vega 64 8GB OC. This $749.99 USD card was top dog in AMD’s graphics portfolio until the Radeon VII made its debut, and for smooth frame rates at 2560×1440, the Radeon RX Vega 64 is a gaming beast. This particular implementation sports a triple-fan cooler populated by our patented wing-blade IP5X-certified fans and married to a special sink that enables 40% more surface area than previous-gen dual-slot designs. The fans remain completely still and silent in 0 db mode, kicking on only when the GPU temperature reaches 55℃. Our proprietary Auto-Extreme Technology, which is now used in the construction of all ASUS graphics cards, ensures consistently high quality thanks to 100% automated production that solders everything in a single pass to reduce thermal strain on sensitive components. It’s comforting to know that reliability is up by 30% since Auto-Extreme was implemented, while the power consumed by our manufacturing process is down 50%, so it’s considerably greener, too. Really, though, we’re most enamored by the ROG Strix Radeon RX Vega 64’s lighting situation. 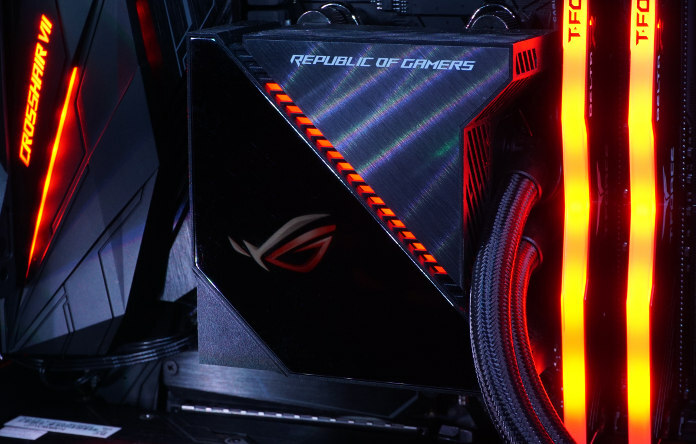 The card features multiple lighting zones, including “Republic of Gamers” splashed across the side and a large ROG logo on the metal backplate. 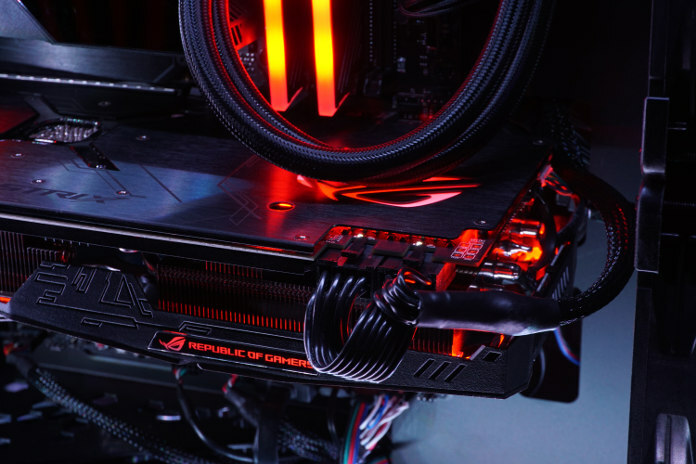 The card’s RGB LEDs get their power from the PCIe slot, which also connects it to our Aura Sync ecosystem. As with other many motherboard-attached components, the Strix Radeon RX Vega 64 8GB OC doesn’t need any lighting headers to integrate with the rest of our synchronized setup. If you’re building a fully illuminated PC, you can’t overlook the importance of its case. The InWin 805i that we tapped is perfect for showing off all the eye candy inside and it’s priced at $250 USD even at InWin. 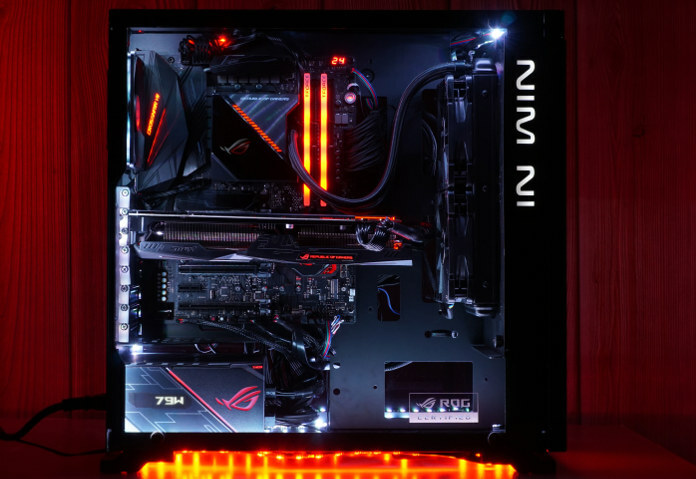 Two smoky tempered glass side panels expose the high-end hardware and flashy lighting we installed; it’s as much of a showpiece as it is a home for PC components. There’s even a long strip of LED lights in the packaging to get you started. 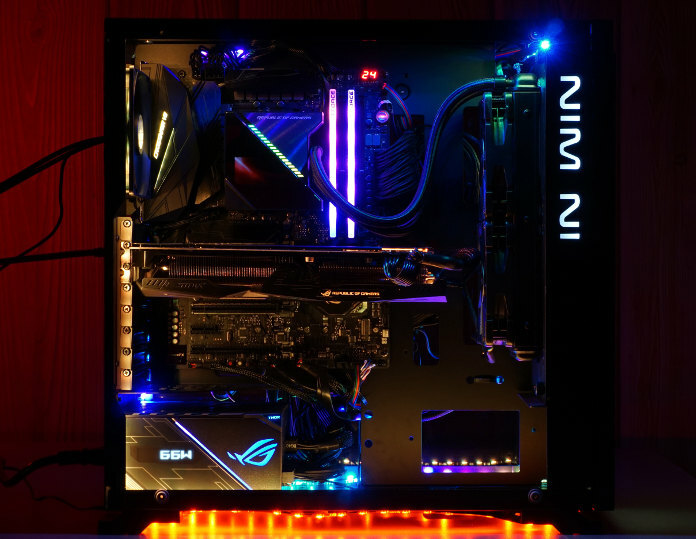 While it’s hard to pick a favorite angle, we’d argue that InWin’s front panel steals the show. It boasts not just RGB lighting, but also a stunning infinity mirror effect that creates the illusion of endless LEDs lighting up the surface. A single cable monopolizes one of the motherboard’s vacant headers, but there’s no other setup required aside from plugging in the connector. The lighting, glass panels, and all-black aluminum construction combine to make an undeniably classy statement. Behind the case’s mirrored front panel, there’s a metal fan mount that supports up to a 280mm radiator or a pair of 120/140mm fans. It’s held to the frame with tool-less thumbscrews, so you can easily remove it to mount your thermal solution of choice before securing it back into place. Underneath the fan mount is a removable hard drive cage that houses up to two 3.5” disks or a pair of 2.5” SSDs. Two more 2.5” drives can be attached behind the motherboard tray. That’s plenty of room for many terabytes of capacity. We chose not to use the cage at all, though. 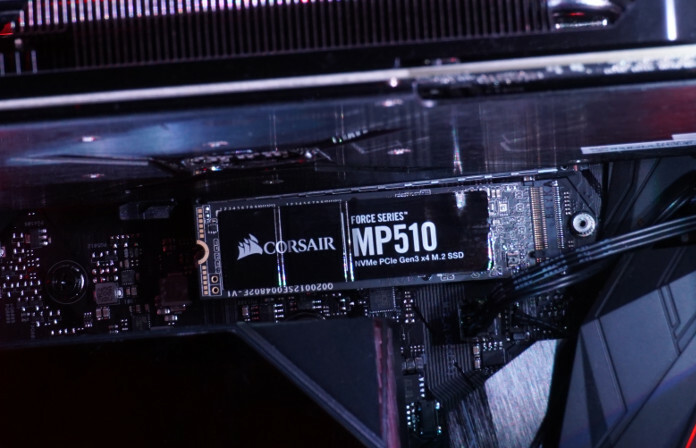 Instead, we opted for Corsair’s MP510, a tiny M.2-based SSD. Physical compactness belies its capacity; the drive is available in multiple configurations, but the 960GB version we acquired for $149.99 USD has more than enough space to stash all of our games and applications. It rocks a four-lane PCIe 3.0 connection and NVMe support, enabling blazing sequential read and write speeds of up to 3 GB/s. You’ll have a hard time locating the drive on our motherboard without some detective work because it’s actually hidden under a shield, perched just above the graphics card. The back of InWin’s 805i comes outfitted with a 120mm exhaust fan, but to keep our Ryzen 7 2700X running optimally, we opted for an all-in-one liquid cooler. The ROG Ryujin AIO with a 240mm radiator is $279.99 USD well-spent. It’s also available with a 360mm radiator, if you feel the need for a third Noctua 120mm fan dissipating heat from your overclocked CPU. We chose the 240mm version, though, because it fit neatly into the 805i’s front radiator mount. This AIO liquid cooler couldn’t have been any easier to install. Because it’s a closed system, we didn’t have to mess with a reservoir, custom tubing, or fittings. We simply mounted the correct CPU bracket for our Ryzen processor onto the ROG Ryujin and fastened it into place. The copper base even comes with thermal paste pre-installed, so there’s no mess to clean up. 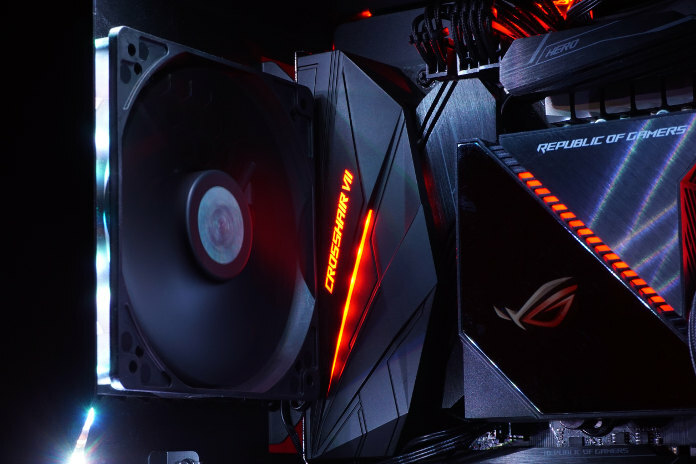 The ROG Ryujin is all black, from its aluminum radiator to the 120mm Noctua fans, sleeved rubber tubes, and 100x100mm block with its embedded 60mm fan, but there’s also a removable CPU cover that sports an RGB lighting zone. Like the Strix Radeon RX Vega 64 8GB OC, it doesn’t monopolize one of the motherboard’s RGB headers to communicate with Aura Sync. Even more striking is the ROG Ryujin’s 1.77” OLED screen, which adorns its cover. We configured ours to play a loop of the ROG logo in full color. However, the screen can also be set to display hardware monitoring information or even a customized animation. 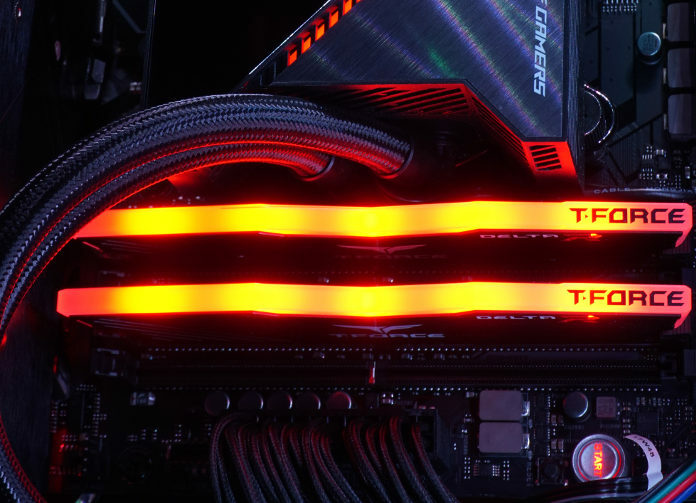 Eager to arm this workstation with plenty of system memory for demanding tasks, we tricked out our Ryzen build with 32GB of TEAMGROUP T-FORCE Delta RGB DDR4 RAM. This kit normally goes for about $115 USD but we liberated this set from another build we had in the studio. The kit maximizes performance by operating in dual-channel mode, but still leaves two slots on our motherboard vacant for future upgrades. 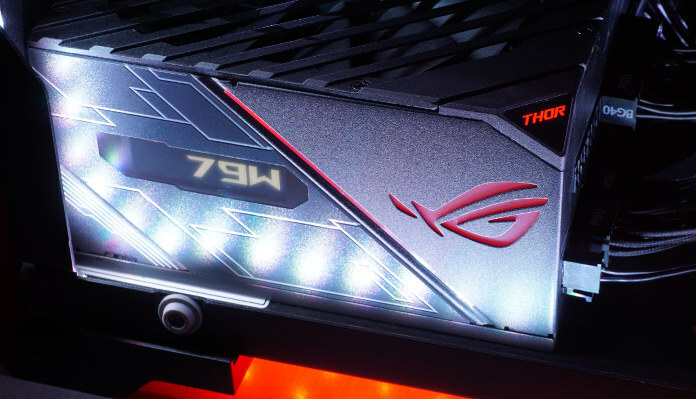 Better still, its RGB LEDs don’t tie up the ROG Crosshair VII Hero WiFi’s headers (notice a pattern here?) and are compatible with Aura Sync. We needed clean, stable power to keep our illuminated Ryzen build planted firmly under full load, so we brought in a PSU with a superhero’s name. The ROG Thor 850P is 80 PLUS Platinum-rated, delivering 850W of juice for $219.99 USD. It’s backed by a 10-year warranty, so you know there’s a lot of confidence behind this PSU’s high-quality platform. Like our graphics card, the Thor 850P offers a semi-passive mode that facilitates completely silent operation at idle. 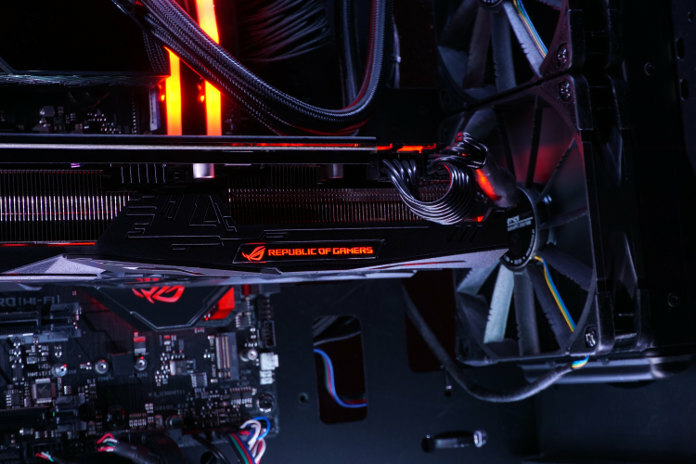 When a bit of active cooling is needed, a 135mm IP5X Wing-Blade fan and ROG heat sinks under the hood keep temperatures lower than competing designs. This PSU is also ultra-quiet. We couldn’t hear the fan at any point during testing, even with the case’s side panel off and our ears close. PSUs aren’t exactly known for commanding attention, but this one has some serious pizzazz. 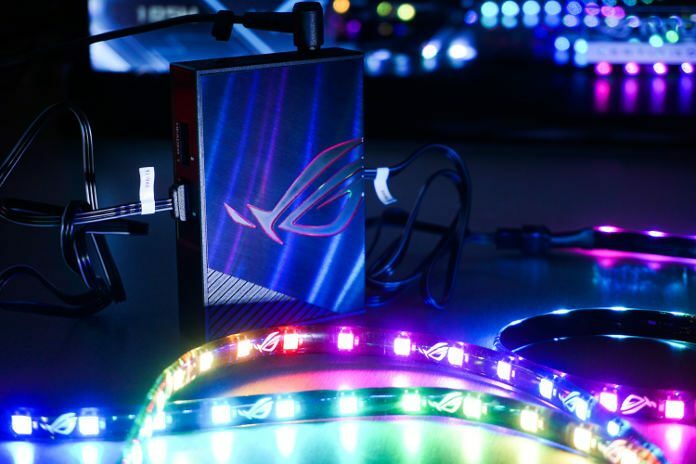 There’s a big glowing ROG logo on one side, an illuminated Thor logo right above it on the angled corner, and an OLED display that tells you how much power you’re pulling from the wall. The ROG Thor 850P is also modular in nature. Because we only needed a handful of cables for our build, we were able to keep the inside of InWin’s 805i less cluttered. One of those cables is a special two-pin connector with an RGB header at the other end. Although loading our case up with components, making sure they’re installed correctly, and connecting everything with care is critical to getting this machine up and running, the fun part is filling it with light. On that front, we went wild, decking out the InWin 805i with strings of RGB LEDs as if it was a Christmas tree. The top, edges, and bottom of each panel were trimmed in light strips. Then we added more to the underside, creating an attractive glow on the desk. We used the 60-LED strip that came with our case and added five more 30-LED strips, giving us a total of 210 addressable LEDs. In addition to all of our custom lighting work, the Aura-capable components inside and stunning front panel infinity-mirror effect created a showstopping case. We couldn’t stop there, though. Adding an ROG Aura Terminal for $79.99 USD allowed us to finesse another 120 addressable LEDs onto the back of our ROG Strix XG35V monitor. 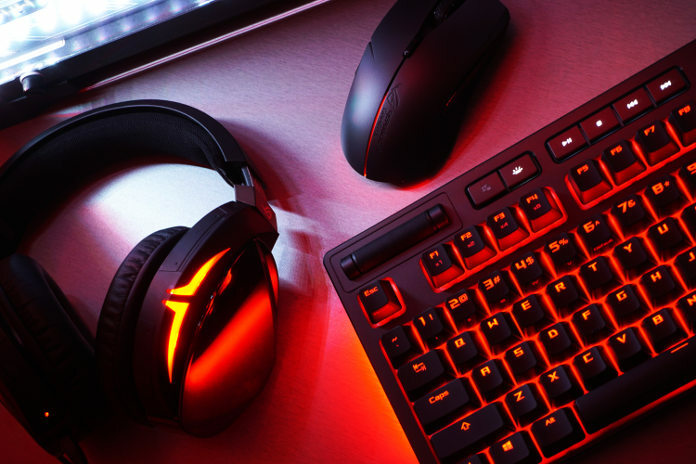 And of course, we got our hands on an ROG Strix Flare keyboard, an ROG Strix Evolve mouse, and the ROG Strix Fusion 700 headset, rounding out an amazing set of peripherals with RGB lighting. We synced everything up using Aura to create an incredibly well-coordinated system. 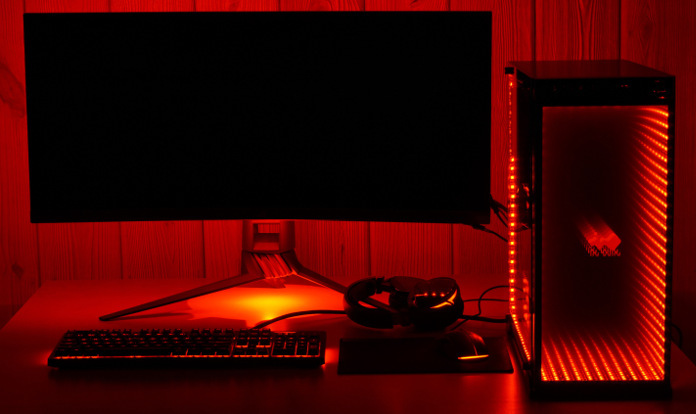 With all the lights aglow, we set about getting our PC purring. We snagged the latest motherboard firmware build, got Windows installed, and ran the most recent version of AI Suite 3 to reach our 5-Way Optimization controls. Whether you’re tweaking your first build or fine-tuning an already-optimized machine, 5-Way Optimization makes the whole process easier. Three presets give you the ability to choose between performance or power saving, or to put the system down quietly with Away Mode. But by clicking the 5-Way Optimization button, you get automatic fan profile adjustments, power settings, and CPU overclocking. The software intelligently nudges the relevant knobs and dials, ensuring stability instead of clumsily applying premade profiles. From there, you can adjust settings more granularly to optimize for specific workloads. The software restarts your PC more than once while it does its thing, so just sit back, relax, and observe. When the system reboots the first time, it brings the software back up automatically and runs a series of tests. After another restart and a few more measurements, it’s good to go. We got a lot of benefit from this optimization process. Bearing in mind that the AMD Ryzen 2700X has stock base and boost clocks of 3.7GHz and a 4.3GHz, respectively, 5-Way Optimization delivered a stable 4.25GHz across all eight of the CPU’s cores. None of that means anything unless the theory applies to real-world applications. So we fired up a litany of games to see how much better they ran. We already knew that this rig could handle demanding titles like Call of Duty: Black Ops 4. But what if we were simultaneously running applications like our web browser and Discord chat, along with a streaming video and recording of the game we were playing? With just CoD running at High settings and a resolution of 3440×1440, OCAT showed an average of 101.5 FPS across all our runs. When we added in multiple running applications, a streaming video, and gameplay capture on top, the average frame rate dropped to 95 FPS. But even during a chaotic firefight, it never dropped below 80 FPS. Truly, this machine can haul. Too often, gamers have to choose between sharp looks and snappy performance. With strand after strand of addressable LEDs, plus Aura-compatible RGB lighting on most of our components, the case itself, and each peripheral, our illuminated build would have been beautiful even if it wasn’t a performance beast. But we didn’t have to compromise with this build. The AMD Ryzen 7 2700X CPU and ROG Strix Radeon RX Vega 64 8GB OC graphics card gave us a powerful punch at a reasonable price, and all the other components were complementary. With the help of Aura Sync, building a blinged out rig really isn’t hard.